It’s technically my birthday now. Huzzah! What better way to see in my 23rd year (DEAR LORD I AM OLD NOW D:) than to bring you my birthday week stash picks! It all looks so pretty in here! Some of my favourites for my eyes today. 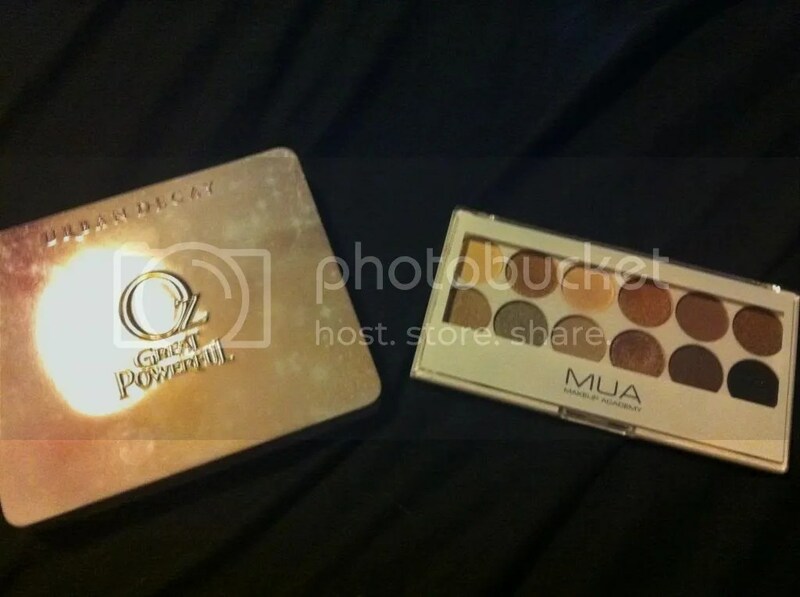 The Glinda palette- obviously- so I can have a bit of glitz when we go for dinner tomorrow. Aaaand MUA’s legendary Undress Me Too palette- I still haven’t decided whether I prefer the original Undress Me palette or this one. A couple of old favourites and a relatively new comer when it comes to liner and mascara. 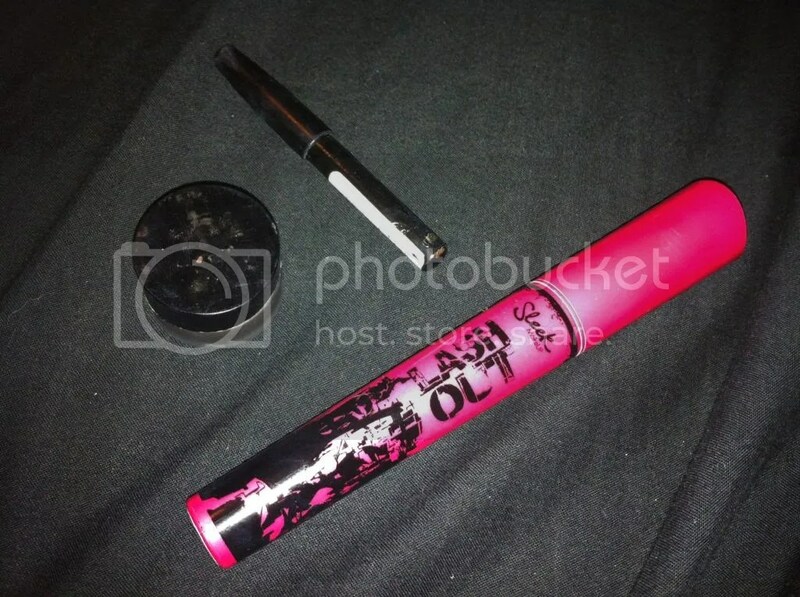 Sleek’s Lash Out actually works pretty well, I’ve found, even though it’s a much smaller brush than I’m normally used to. Also up is Elizabeth Arden Colour Intrigue Gel Eyeliner- the pot says it’s brown, but I’ve had it for a while and I am so sure that it’s black! The little stub of a pencil is what remains of a Maybelline liner pencil- pretty standard. Cheekwise, two ELF and one MUA this week. I’ve yet to use the ELF mineral bronzer- which is in shade ‘Bronzed- and I’m worried it’s a bit too dark, so we’ll have to see how that goes and I’ll have to be very careful to use the lightest hand ever when applying. 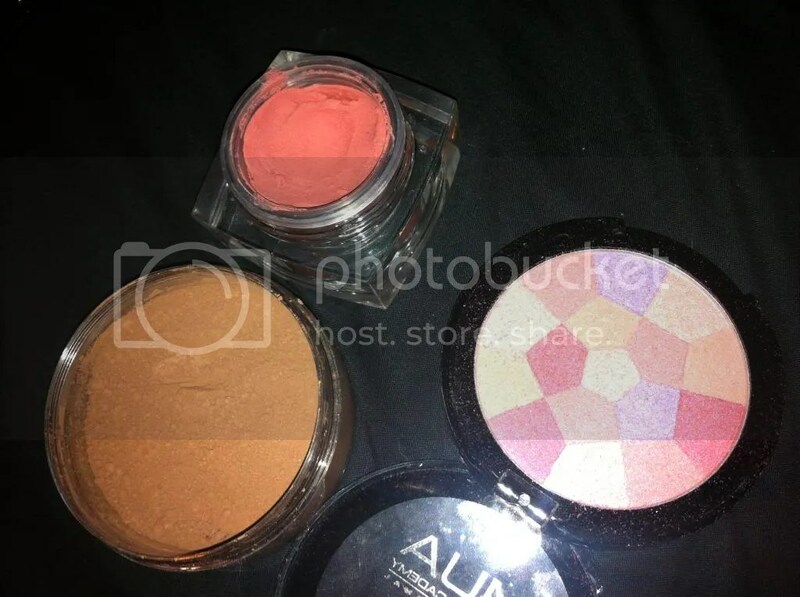 Blush wise, I have the ELF Studio Cream Blusher in Tease- a great, natural flush effect- and MUA’s Mosaic Blusher in English Rose- very sheer but reasonably easy to build, and a lovely effect thank to all of the different shades in the pan. I will warn you now, I may end up changing the tinted moisturiser by the end of the week! I decided to use a moisturiser (Natural Collection Tinted Moisturiser in Natural) because the weather has gotten so warm over the last couple of days, I thought it’d be much nicer; however, I think this must be a shade too dark or something because I wore it today and I looked like an Oompa-Loompa… it was not a pretty sight, tide-marks ahoy! 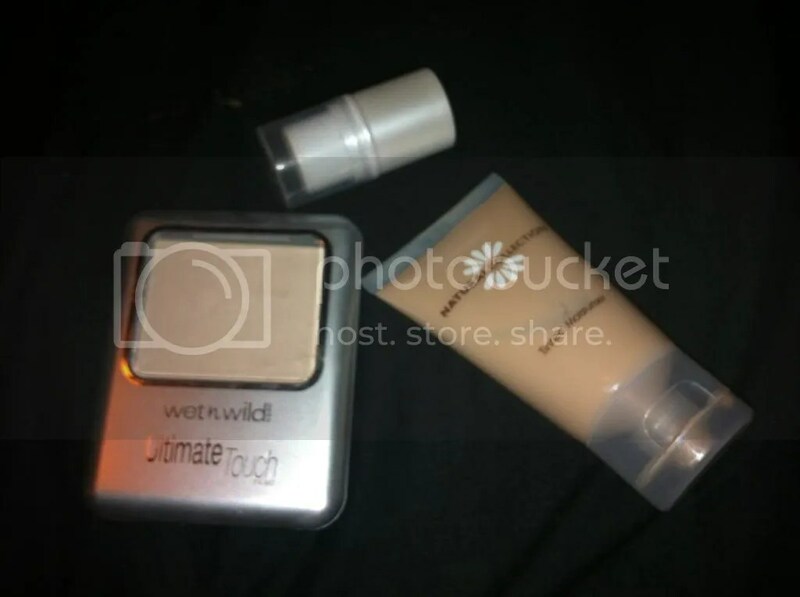 Powder wise, this is the Wet n Wild Ultimate Touch powder I picked up in Poundland. I have no idea what shade it is, as the ingredients/details are all in a pictographic language- I think it might be Chinese. However, it does say ‘Natural’ so I’m going to go with that! Concealer is my trusty ELF All-Over Colour stick in Apricot Beige- I fully expected this to be too dark but it’s perfect. I’m feeling bold this week, apparently! 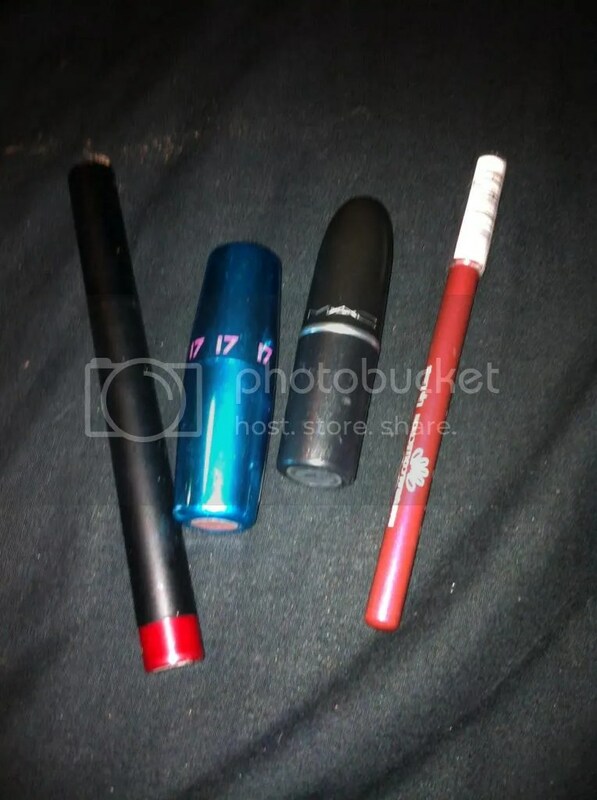 Left to Right is ELF Studio Matte Lip Colour in Rich Red, 17 Mirror Shine Lipstick in Nudist Peach (the only natural here), MAC lipstick in Cockney (which is a Lustre finish) and a Natural Collection Lip Lines liner in Mulberry, which is still quite muted and blendable and works as a base for most colours. I’m looking forward to my make up this week, though I am a little iffy on the tinted moisturiser. Do you own or like any of these products, fat fashion fans? 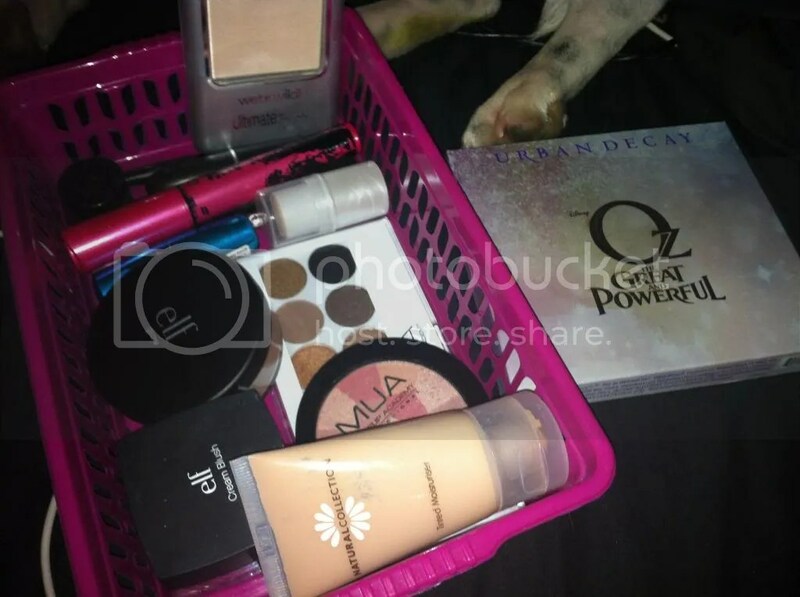 This entry was posted in Beauty, Hair, Makeup, Fashionista Musings and tagged ELF, MAC, MUA, Shopping the stash, Sleek, Spending ban, Urban Decay. Bookmark the permalink.